In Jackson, Tennessee, pride abounds in our southerness and Judaism. We are a community in all aspects of the word. This is a place where everyone knows each other’s name and Shabbat dinner is shared as one family. For over 130 years, the congregation has continued its vital role of weaving our rich culture throughout this community. Our beautiful, stately structure (renovated in 2014) has graced the corner of West Grand and Campbell streets since 1941. 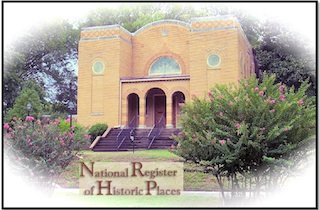 We are small, welcoming Reform congregation of about 30 families overflowing with a rich history dating back to 1885. Shabbat services are Friday evening at 6:00 p.m. in the beautiful sanctuary, which was refurbished in 2014. These services are a treat, simply in their variety, as they are led by members of the congregation. In true Jewish and southern tradition, this congregation combines faith and community in every aspect. Following Shabbat services, the congregation joins together for a friendly informal dinner at a local restaurant. Rabbi-Cantor John M. Kaplan (Cantor Emeritus – Temple Israel, Memphis) comes to Jackson from September-June, to conduct services once a month beginning at 7:00 p.m. Friday evening. His responsibilities include preparing B’nai Mitzvah students, as well as counseling members on personal, spiritual, and ethical matters. Following Rabbi-Cantor Kaplan’s Friday evening service, we celebrate Shabbat with an Oneg Shabbat. He also conducts a Shabbat morning Torah Talk and a Saturday evening dinner and family program ending with an intimate Havdalah Service. If you are new to the area, contemplating a move to Jackson/West Tennessee, or already live in the area, we invite you to join us for services and to become a part of our family. All are welcome. Please email us if you would like to be added to our B’nai Israel Weekly email or would like to have additional information. Our street address is 401 West Grand, Jackson, Tennessee, and our mailing address is P.O. Box 10906, Jackson, Tennessee 38308.